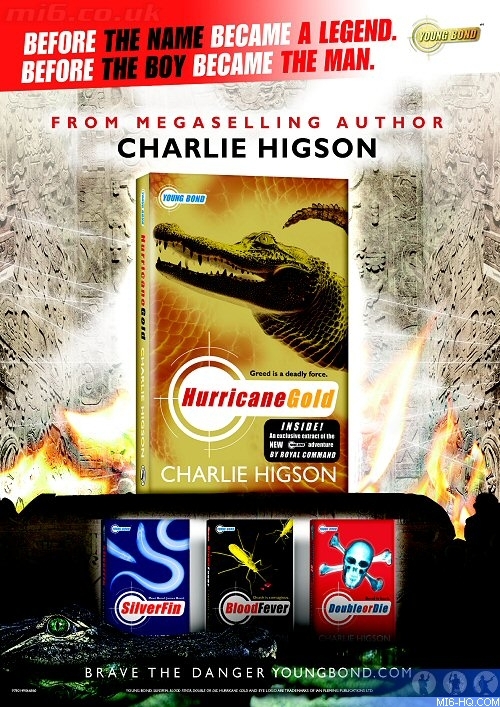 Puffin have released a new promotional poster for the upcoming paperback edition of Charlie Higson's fourth Young Bond novel "Hurricane Gold". The new edition will be in UK stores on May 28th to coincide with the Ian Fleming centenary. The poster - which is not available to buy and will quickly become a much sought after collectors item - is A2 format (420mm× 594mm). Ten posters are being given away to lucky MI6 readers! "Hurricane Gold" Posters To Be Won! What is the name of the villain's island in "Hurricane Gold"? The competition closes at midnight GMT on 1st June 2008. MI6 will choose the winners at random from the correct answers received. The winners will be contacted via the email address supplied and their postal address will be requested. If a winner fails to respond within 7 days of prize notification, another winner will be chosen until all prizes are allotted. Competition is open to international MI6 readers. Images courtesy Puffin.